On a day that starts out like any other, an 11-year-old boy's life is changed forever. As the main character and his friend Miki pass a leisurely afternoon, Miki suddenly collapses from an unknown illness. When the girl shows no sign of waking, the main character grows distraught over not being a better friend and not having the means to save her. Suddenly, a strange voice offers him a second chance: "Beyond the door you can change your destiny!" He soon leaves the real world and journeys to the world of Vision, where, as a novice "Traveler," he will surmount myriad ordeals in hopes of ultimately meeting with the Goddess of Fortune to have a single wish granted. 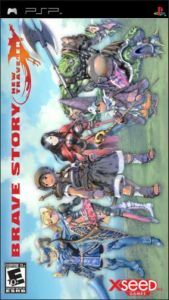 A role-playing game with an epic tale, introducing unique characters with distinct personalities and leading the player through the imaginative world of Vision as he learns to become a hero. Friendship - Form bonds with party members to create new, cooperative skills. Courage ... Use "brave power" (BP) to unleash powerful special abilities, continually refilling the gauge as you devastate the enemy. Growth - The hero's main weapon will evolve as he collects the gemstones needed to meet with the Goddess of Fortune. New accessories can be forged by collecting and combining the right materials. Each character can also unlock a one-of-a-kind innate ability. 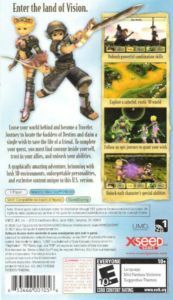 Beautifully rendered 3D graphics with vibrant colors and a distinct visual style, highlighted by polished character and enemy movement, graphical representations of sound effects, and a unique animation for each special ability ... all exceptionally well drawn and intricately textured. Collect special birds which you can use in mini-games or trade in for rare and precious weapons, armor, and items. Network with friends to trade your birds, or game-share a mini-game to have friends assist in capturing rare birds.